Personalized Christmas picture frames are the perfect gift for family and friends this holiday season. An attractive Christmas decoration that can be used every holiday season, these quality laminated wood frames feature a 4 inch by 6 inch glass window to display a picture of your favorite person or people. 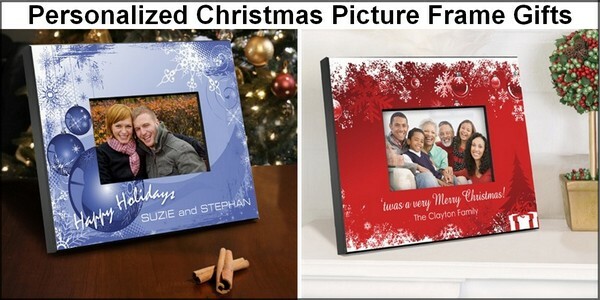 Christmas picture frames are available in a variety of designs to feature the loved ones in your life. All frame designs are personalized with up to three lines of custom print to include names and dates or a fun caption to celebrate the family traditions of Christmas. Each frame features a sturdy easel to place on desktops, tables, countertops or fireplace mantles. Family and friends will cherish this attractive personalized Christmas gift year after year.